I have tried every type of fish, and just a few months ago I discovered that I liked catfish. I think I like it because it is a fresh water fish and is very sweet. Jon loves seafood so I decided to get some catfish today. I didn't want to just bake the filets like I did last time, so I made fish sticks out of them. In a bowl, combine the breadcrumbs with the parsley, thyme, garlic powder, paprika, salt, pepper, and cheese. Dip each piece of fish in the flour, then milk, then breadcrumb mixture and place on a baking dish/cookie sheet that has been sprayed with cooking spray. I liked these. Since I'm not a huge fish fan, the spices in the breadcrumb mixture added nice flavor and disguised the fish a bit! 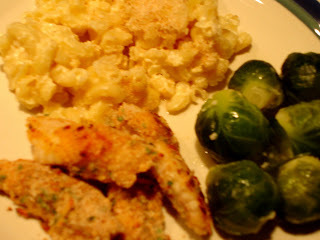 My creamy mac-n-cheese recipe can be found here. Warning - it's not healthy, but it is oh-so-yummy! I introduced Jon to Brussels sprouts a few months ago and now he loves them. 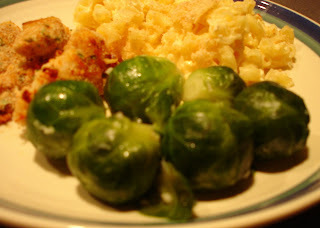 I cannot remember where I found this recipe for garlic Brussels sprouts, but when I do I will post the link/source. Trim the end of each Brussels sprout; set aside. Add sprouts; toss to coat. Add the broth, salt and pepper;cover and cook for 12-14 minutes or until sprouts are tender.